On view in our Video Room is American At Work by Ohio-based artist Kelley O’Brien. In her multidisciplinary practice, O’Brien explores how social systems are created and maintained through architecture, both physical and constructed. In American At Work, we watch Angel, a naturalized American citizen from Mexico City and General Services Administration employee at the Anthony J. Celebrezze Federal Building in Cleveland as he performs one of the duties of his position. 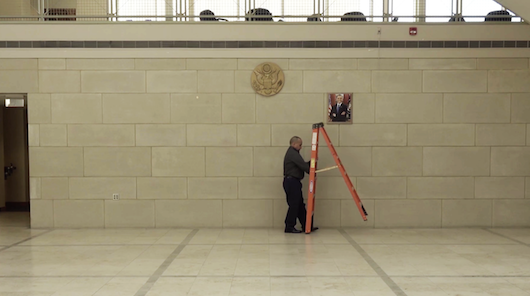 While he removes and replaces the outgoing portraits of Barack Obama and Joe Biden with that of Donald Trump and Mike Pence, the viewer is reminded of the continued effort of the current administration to wall off his homeland. For more information on Kelley O’Brien and her work, visit her website.